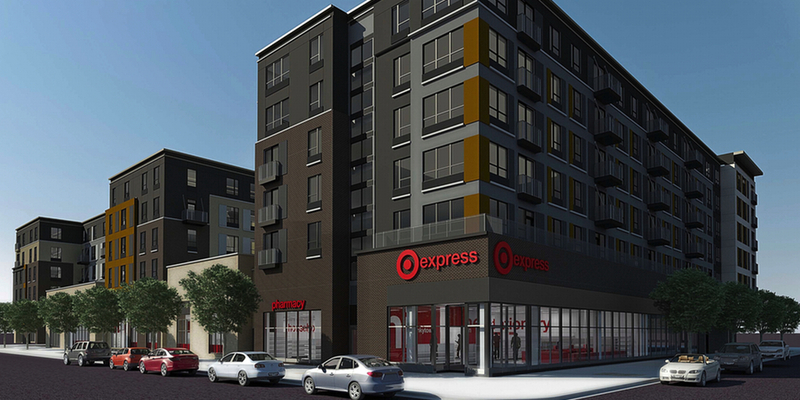 The rendering of the first TargetExpress really makes it look like any of the corner Walgreens you’ll find in many cities. A decade ago, the trend in big retail stores like Target was to get larger and larger, with mega-sized SuperTargets popping up around the country. Then the country’s over-mortgaged house of cards collapsed and smaller was all the rage, resulting in CityTarget stores in 2012. But that’s apparently not small enough, with the retailer set to go even smaller with new TargetExpress stores. The Minneapolis Star-Tribune reports that the first TargetExpress, set to open near the University of Minnesota campus this summer, will only be 20,000 square feet in area, about 1/8 the size of your standard Target and about 1/4 the size of a CityTarget store. TargetExpress is aimed at the urban shopper who wants a place to get most of the things they need but without having to go to a mammoth store on the outskirts of the city. The retailer says that the smaller store will still have those items people want the most from Target — health and beauty products, groceries, pharmacy, some home goods and electronics — but is designed for shoppers who are purchasing fewer items. By it’s description, TargetExpress is starting to sound less like a small Target and more like a larger Walgreens or CVS. It certainly can’t be any worse than the retail hell I experienced shopping at the Brooklyn Target for seven years.